Finland's Nautor Swan line's transition to a more cruising-oriented line has been punctuated by the introduction of some dazzling new designs, including the new 55. 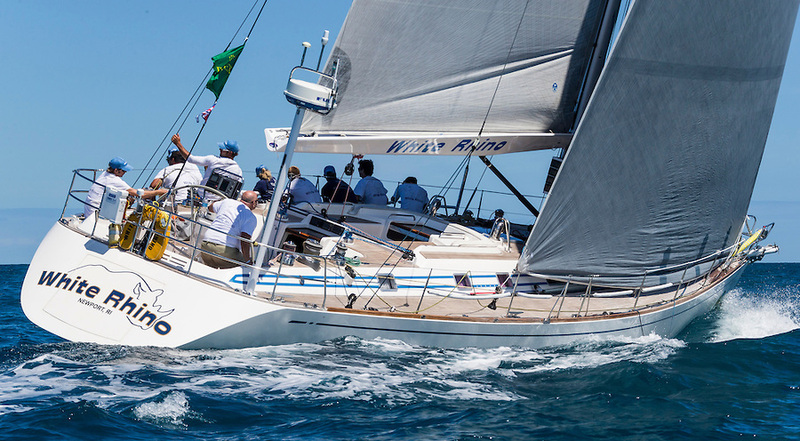 In fact, the 55 makes no pretension to being any kind of racing yacht. This model is being promoted as a pure cruising machine. 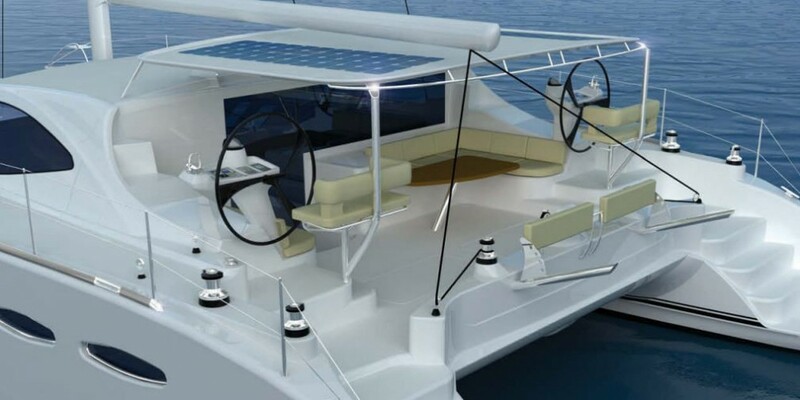 Consider however, that with hull and appendages from German Frers and Nautor's long history of producing excellent performing yachts, we can expect to see a very quick cruising yacht in the new 55. 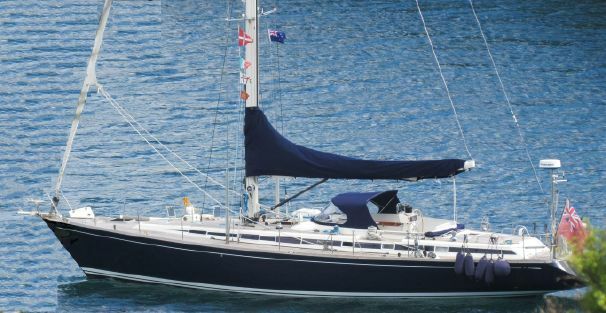 A Swan 55 lies peacefully in a secluded cove. 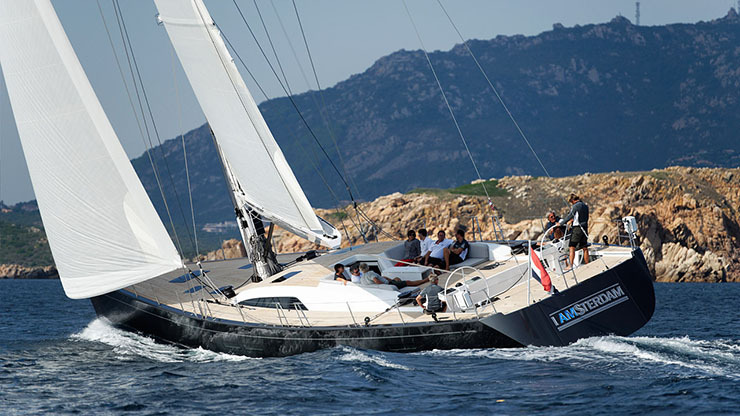 With a D/L ratio of 294, Frers has given us a heavyweight. 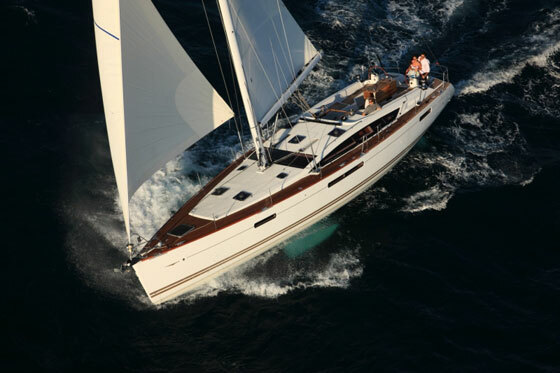 The hull shape of the 55 features moderate deadrise to the midsection for additional volume below the cabin sole. This is space required for the plethora of mechanical and electrical components. The stern overhang has been drawn out, but the bow has been cut quite short for a Swan. This is probably in an effort to lengthen the useable interior space. 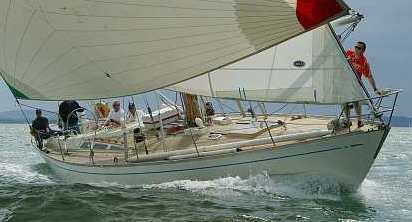 The keel appears to be forward, but it is easy for this type of design to gain weight aft quickly. 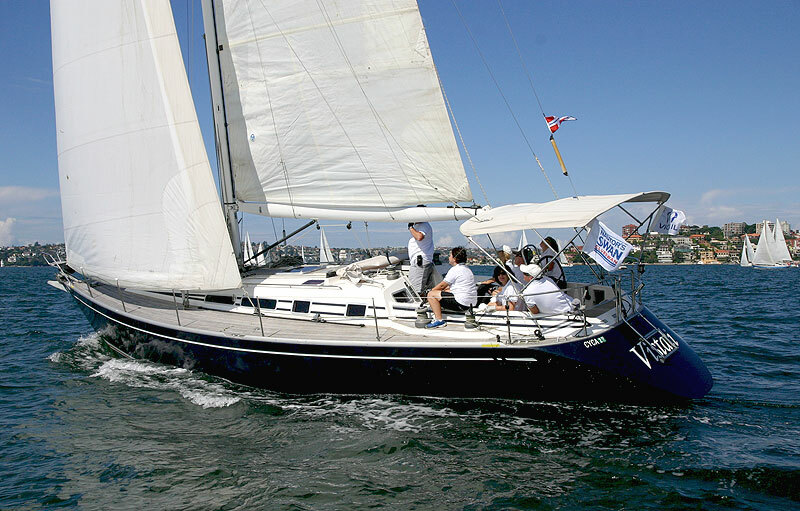 The keel has volume pushed into its foot to optimize the stability. Draft is a generous eight feet, six inches in keeping with the trend toward deeper draft. The rudder is a deep, elliptical-tipped, semi-balanced spade. Turning to the deck plan, it is a tough exercise in ergonomics and aesthetics. The designer is pushed to keep the profile down, while interior considerations do their best to push the deck up. The Swan 55 shows an honest way of dealing with this feature by not hiding it at all. The cockpit coaming is simply superimposed on the lower trunk and minimized in its complexity and corresponding bulk. The deck lines are accented with recessed center portions fore and aft on the cabintrunk. This slight indent, about five inches wide, extends the full length of the trunk but doesn't show on the sail plan. The trunk is carved away in way of the coaming to ease access and egress from the cockpit. This step area also allows the primary winches to be mounted lower and further reduces the overall height of the 55. 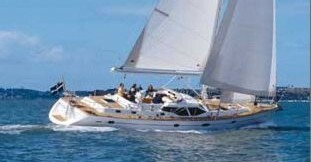 As evidence of Nautor's seriousness in attacking the cruising market, the sail plan is drawn with fully-battened main and lazy-jacks but still has both inner and outer babystays and runners. I would presume this in order to offer a cutter rig option. The SA/D ratio is 15.5 and that is very sedate by today's standards. Down below, the Swan 55 is perfect. 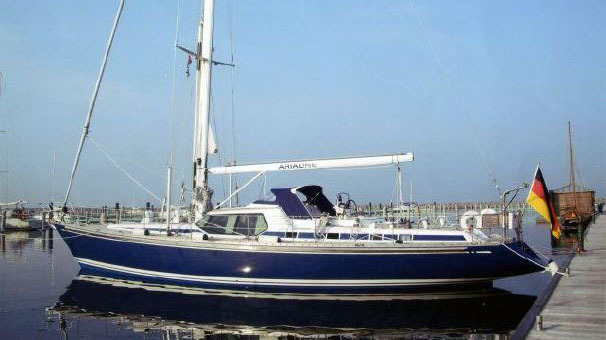 There are shower stalls, reading seats, a snug cabin for the kids and two luxurious staterooms. The galley is big with an above-counter level refrigerator with freezer under it. Access to the aft stateroom is either through the galley or through the shower stall. The island settee in the main cabin makes for a dining area that can comfortably seat six. While you are still living down in the boat on this model, there are enough hatches and large windows to let in plenty of light. The 55 has tanks for 163 gallons of fuel and 232 gallons of water. The engine is a 116-horsepower Perkins driving a three-bladed Max prop. Access to the machinery will be through the owner's shower/head areas.